Now that your account has been approved and verified on Wyre, the next step is to add some funds to the platform. 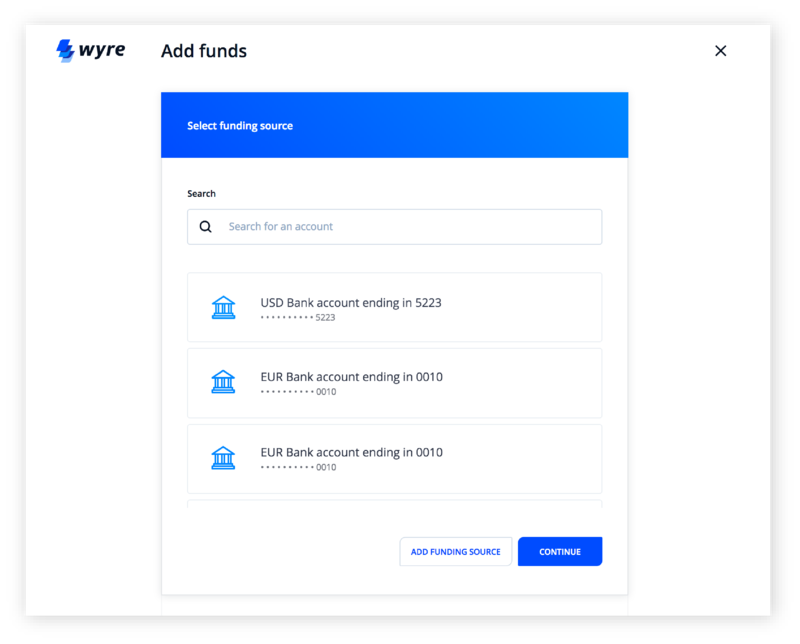 Step 1: In your Wyre dashboard, click on Add Funds. Step 2: Add a funding source, either via Connect Bank or Manually Enter. 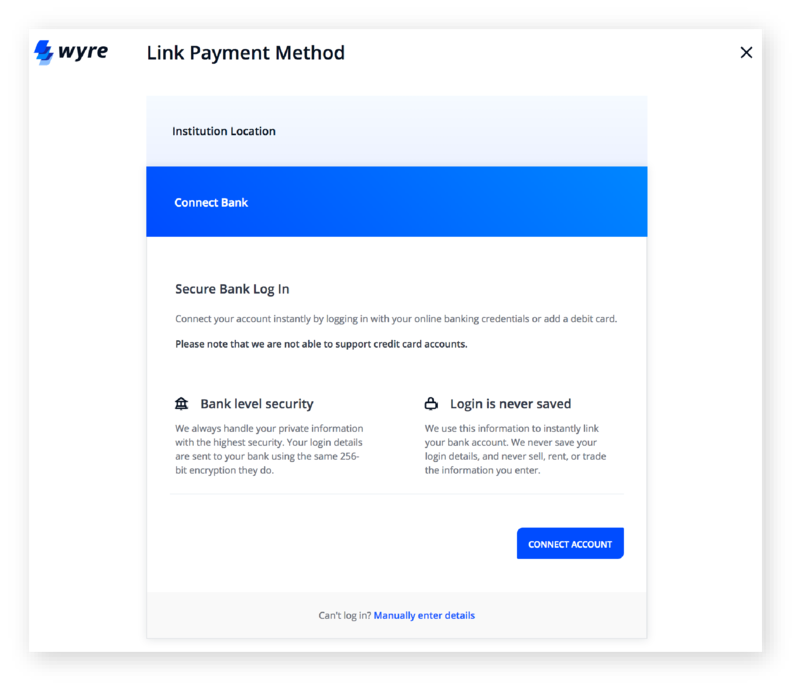 If you choose Connect Account, you will be asked to log into your online banking platform to automatically sync your information with Wyre (your banking details will not be shared with Wyre). This option supports direct withdrawals (ACH). If you choose Manually Enter Details, This option will ask you to enter your bank information manually and upload a recent bank statement matching this account. With this option, you will need to wire funds to top up your Wyre account. Payment methods are reviewed and approved within 24 hours. Select transfer type, Direct Withdrawal (ACH) or Manual Wire Transfer. This step is only available for bank accounts that are linked via bank login credentials. Enter the deposit amount you'd like to send in. Review and confirm the transfer details. If doing a Manual Wire Transfer, we will share our bank information with you so you can initiate the transfer on your end. As soon as we receive your transfer, we'll credit your Wyre account with the full received amount. This balance will be visible on your dashboard, and you'll be able to use that balance to send payments right away! You've created a transfer on Wyre. If sending wire transfer, make sure amount matches the amount on your created transfer. If sending wire transfer, make sure the transfer comes from the same bank account you have registered on Wyre. ACH transfers take 3-5 business days to complete. The weekly limit for ACH is $2,500 USD, monthly $10,000 USD. ACH is only available for US users. US domestic bank wires normally arrive within a few hours, and international wires normally take between 1 to 3 business days. Wyre does not charge any wire fees but your bank provider most likely will. These fees range from 15 USD to 30 USD per wire transfer. You can set up a wire transfer very easily through your online banking platform, you do not need to go to your local bank branch to initiate a wire. However, some credit unions do require you to visit your local bank branch to make a wire transfer. It is best to contact your bank representative to learn more about your options. Any questions or concerns about you transfer, please contact [email protected].